Greetings from Eagle Treks to those who are interested in doing the Upper Mustang Trekking. This is the forbidden kingdom trek in the Nepal Himalaya. Lo-Manthang is the capital of this region. Upper Mustang Trekking closes for foreigners until 1991 in order to avoid the influence of western culture. After 1991 this trek opens for foreigners. A special permit from the department of immigration of Nepal requires to trek in this region. 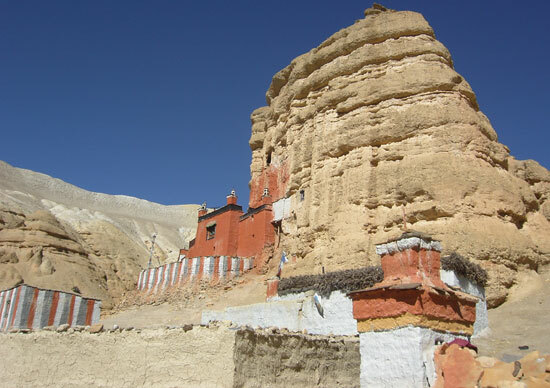 Upper Mustang was a separate kingdom within Nepal until the time of Monarchy till 2006. Even after the downfall of Monarchy, this small Tibetan settlement has also the same respect for their King Jigme Paramal Bista. The trek to Lo-Manthang through high altitude desert country climbing in and out of the huge sided valley of the Kali Gandaki. In places, the gorge with which the Kali Gandaki River runs is the deepest in the world. This region is full of some of Nepal's oldest Buddhist Monasteries, ancient and isolated villages with quaint whitewashed houses. Nesting on the Tibetan border, this region is dominated by giants Annapurna, Nilgiri, and Dhaulagiri massif. Situated at the head of the Kali Gandaki in north-central Nepal. The little-known district of Mustang is naturally and culturally attractive, in particular, the origin of Tibet. Tourists in Upper Mustang can opt of a strongly wrinkled landscape of this remote territory. It also presents a vibrant mosaic of earth colors - red, yellows, browns and blues. This location is full of ecological diversities, delightful views of snowy peaks, colorful villages, monasteries. Not only mani walls, ancient palaces, Tibetan culture and heritage and many more. Day 10: Rest day at Lo-Manthang to explore around Lo-Manthang and it's beauty.